Chaplains are one of the lesser-known roles in large BPOs, but they play a vital role in both developing team members and supporting them through rough times outside of the workplace. 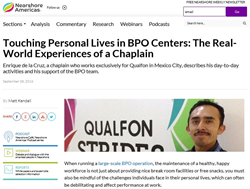 Nearshore Americas, a leading business media and research organization, profiles Cruz’s day-to-day work and Qualfon’s interfaith chaplaincy program, demonstrating how chaplains can “touch the lives of employees” and ultimately “affect performance at work,” the article states. Following in the footsteps of Cruz, the article sheds light on what work is like for a chaplain, but it also features chaplain training requirements as well as Cruz’s unique approach in making peoples' lives better. Cruz starts his day at the Qualfon interfaith chapel. “I stop here because it provides me with the serenity I need in order to provide care and assistance to the team. It’s very important for me to be able to transmit this serenity to others,” said Cruz in the article. Qualfon’s Worksite Chaplaincy program has been implemented at contact centers around the world and with great success. In 2015, Qualfon chaplains performed more than 6,000 personal care sessions and roughly 500 visits to hospitals, funerals, and homes. Most Qualfon contact centers have a dedicated chaplain who has an office onsite and gets to know employees on a personal level. Chaplain care sessions are available 24x7x365 and offer guidance on issues such as relationships, stress, maintaining a healthy life balance, financial hardships, personal crisis, physical and substance abuse, as well as suicide and death. In addition to their years of experience, Worksite Chaplains receive extensive training and continuing education through the Qualfon Formation Center. Using active listening skills, Cruz encourages Qualfon employees to open up about any problems so he can better understand their inner thoughts and experiences and support them both emotionally and spiritually. He then works to put together one-on-one care sessions, group workshops, personal counseling plans, life plan sessions, and more. His support extends into management too, helping leaders handle conflicts and enhance teamwork and decision making. “Wholly and truly, healthy individuals can bring creativity and efficiency in their work, so we find the time to respond to their needs and foster sustained emotional wholeness. We are committed to know the lives of people and help them get through crises,” said Cruz.